Significant growth in car rental industry in Romania is due to expansion of fleet size of car rental companies and rapid penetration of internet and smart phones. Car rental industry in Romania has been growing exponentially as more and more travelers come to visit Romania every year from all over the world. In this context car rental agencies can generate huge online bookings with fully functional, mobile responsive and interactive car rental websites. With an interactive car rental website, travelers can search, view and book cars easily without any hassle. Resulting more online bookings and less operational cost. We are a travel technology company provide travel portal development solution, car rental website development, Vehicle rental solution, hotel & resort booking solution, XML API integration and GDS integration service for travel agents, car rental agencies and destination management companies as per their demand and business requirement. Orisys Infotech provides bespoke and web based car rental software development service as per the the requirement of car rental companies. Our customize car rental solution is best match to the requirement of car rental agencies to make their rental service full of fun and easy to manage. 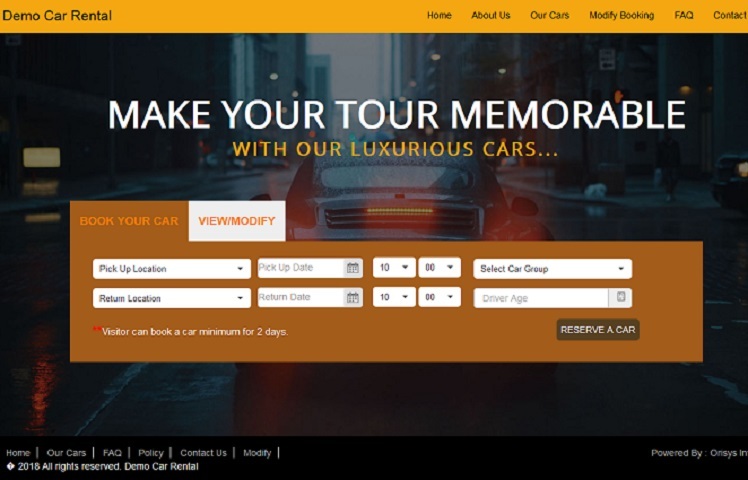 Orisys Infotech is one of the leading bespoke car rental software development companies, providing Bespoke Car Rental Website Design and Development with online booking solution throughout the globe. We provide car rental solution for car rental companies simplifying the car rental business with fully functional booking engine and easy to use car rental booking websites best match to the individual car hire companies, tour & taxi perators. Orisys Infotech provides customized software development and consultancy services for businesses who offer airport transfer services and point-to-point car rental services. Orisys Infotech provides bespoke vehicle rental solution for online travel agencies and car rental companies as per their requirement, which can best solve their business purpose. Our vehicle rental solution for OTAs includes car rental website development, Airport transfer booking solution, camper van rental, Limousine booking and XML API integration. We at Orisys Infotech provide Effective integration of third party Web Services / XML API into your existing application. As an API integration company we are providing integration services for Flight booking, Hotel reservation, car rental reservation, bus booking, payment gateways and SMS gateways.